Last week I published a big guide on how to work from home that covered the ins and outs of the whole shebang. Since then I’ve had a lot feedback and interesting questions, especially from bloggers who are looking to make a transition to working from home but aren’t sure how to pay the bills in the meantime. Today’s episode of Blog Tyrant’s XPeriments is all about a few little tips I picked up over the years on how to do just that. Subscribe on iTunes or you can download it to your computer. Why you need to be careful when switching from a job to a work from home setup. 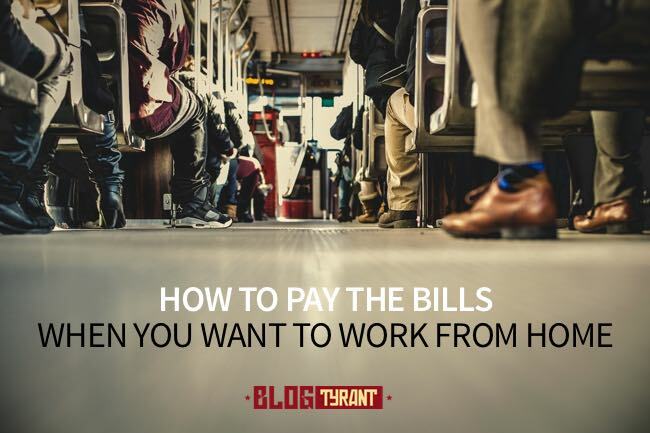 Three ways you can use the skills you build blogging to help pay the bills. How I paid the bills while I was building my blogging business. Two areas you need to focus on aggressively when you finally make the jump. Why you need to start a blog and not use LinkedIn as your base. I’d really love to hear your own personal stories about making the switch from a “real” job to a work from home set up – especially if blogging plays a role in that process. Please leave a comment below. Loving these shorter format podcasts. For me, I started to do freelance web development on the side while keeping my full time job. Eventually I was making enough from that so I could quit my job. Still in a transition phase from freelancing to blogging, but I always have the freelancing to pay the bills each month. I think that’s a really smart way to do it. There’s no hurry. It’s a big mistake many people make. I enjoyed your post on working from home and I always enjoy listening to your podcast. Working from home has been a blessing for me. I had to leave my corporate America management job due to my health. So working on my blogging business has been so helpful. I found that I needed to work hard for about 6 months till I was hitting my income goals. But it was worth it! Hope your health is okay now, Sue. Enjoyed listening! Its not an easy transition. I made sure I had money saved up and you really have to believe in yourself. I didn’t leave until my side business made more than my job. That’s actually a really interesting measuring stick. Thanks for sharing, Darius. I welcome your help much. I was teaching English in China and broke my knee coming home for vacation. China requires a lot of walking. So I decided to stay in the states and start a blog to share information about teaching and excerpts from my e book, “Hunting Elephants In China: Cheap Adventures Off The Beaten Track”. Blogging comes easily for me, as I published an e mag about 20 years ago and wrote a bi-weekly newspaper column. But such advice as your’s is crucial and wonderful. That book title makes me feel uneasy…. Excellent advice, especially with regards to growing your mailing list. I’ve experienced this myself. Thank you for putting out such great content! Thanks Luke. Appreciate the feedback. Publishing helpful ebooks is an easy and profitable way to bring income while building a business. Hi Jennifer. How do you promote them? Interesting techniques. What do you find converts best? Because of the information you give I have found the courage to retire from my job and follow my dream of being a writer. I have not launched my site yet and am hoping I can do so in the next couple of weeks. All your information has been helpful and I appreciate what you do. Hi Cyndy-loo. Please don’t retire from your job until you have a sustainable source of alternate income. Be very careful about that decision. I think you missed out on the word “retire”. In Canada – when you retire you get to collect money from your retirement savings. Hello Ramsay,always love your posts. but I never received my copy of the “my guide to profitable blogging” from you when I signed up. could you email it to me now. keep forgetting to mail you. Thank you. Keep up the work. [ Smiles ] This is splendid advice for those people who wish to work at home. There are a lot of people who have that desire to work from home and thanks to you, you have taught them how to do it successfully. It’s only a very small part of the whole pie, but I hope it helps. I think the biggest question is how you plan on living, like by paying rent or owning a home. How would you finance a home if you chose to go that route?. It’s a bit more complicated than having a good paying job and just taking out a mortgage, because a blog earns a slightly different amount every month, and the times you get paid can sometimes only be once a month, depending on whos paying you. Finally someone wrote a post about this subject though. To go more in depth would be even better, but this is good enough. Thanks Ramsay :). Yeah that’s a good point, Owen. In Australia most banks don’t do homeloans for small businesses unless they have 5 years history and that history is consistent. A regular job with a contact on the other hand can make that much easier. Thanks Ramsay. About email lists – I don’t have many as yet (around 500), and I don’t send out emails every time I post. In fact, I haven’t sent out a single one yet. I just think that there isn’t much point yet as I won’t get many people actually clicking you links, and I might annoy people with the constant emails and lose subscribers. I post an article every 3 days on average. Should I start sending out an email every time I post, or wait until I have a bigger list? Mate you gotta start sending out! That’s how you grow your mailing list because those people promote for you! I’m a bit late…I just learned that you have a podcast..another one to listen to when I drive home later. Cant wait to listen to this. Its better to make a gradual transition that an abrupt one. Work part-time before switching to full-time and make sure before you go full-time working from home, you have the required mastery over the skills you would be selling to your clients. Yeah I think this is a pretty solid approach for lots of people. Thanks for the advice, I’m just starting off the ground with building my mailing list ( wish I started it few years ago ). Its going pretty well for now. Thanks for sharing with us such quality content. Keep up the amazing work! 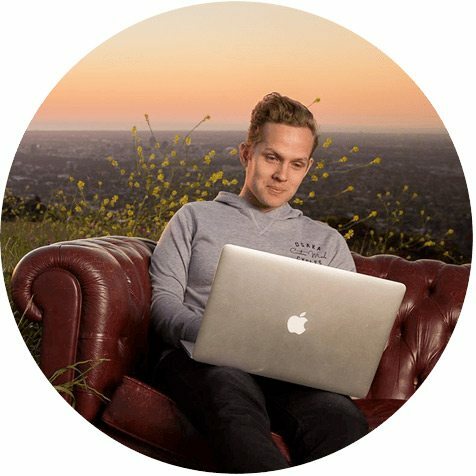 Great content and great tips! Indeed better to first slowly get your feet wet before diving all in. Sometimes all we wish is to give it everything we got, but patience and strategy are key to set your business up for the future. Keep em coming! It asks me to login to download the podcast. Login to what? Hmmm… that’s a new one. I’ll look into it. Thank you. All fixed! I added the wrong link. I’d say that my transition was as smooth as a flight through SE Asia during monsoon season LOL….fellow travelers know what I am talking about. When I did make the jump, effectively, I just got so darn serious about being free that I built my day around my online business, doing stuff related to my blog, and my eBooks, and my coaching and consulting services, and blog commenting, and when I did that, I got the skillz to pay dem billz lol. Thanks Ramsey for the inspiring share! Thanks mate. And thanks for tweeting, as always. Appreciate it. BTW – your comment was in the spam folder. Might want to give Akismet an email. Ramsay, you’re an ideal boyfriend! I’m in the very early stages of blogging, just messing around until I get the hang of things. How do you find the various sources of online work that you mentioned, apart from approaching small businesses yourself? Hey Ramsay, Thanks for the review.. , tThis information you give I have found the courage to retire from my job and follow my dream of being a writer ! You see I got into internet marketing late in life, I’m now renting a property for me, my partner and my two kids – I will soon need to move to a bigger house so my kids can have separate rooms. So I really feel I understand paying the bills. As the need to provide for my family and make sure my kids get the best starts in life, I focused more on building my career, while my internet business has taken a back seat. I’m glad to say that the shift has started to happen and I’m able to spend more time working on my business. …And I love the idea of taking paid content writing jobs that will help me get better at writing content, while making some additional money. That’s truly paid to learn. I’ve shared your podcast on Facebook & Twitter and look forward to reading more posts from you. Great post btw. I am a new sub! When you talk about doing other things to do online (virtual assistant, etc) how do you remain competitive because people say for instance, overseas will do the work at a much cheaper rate? Love the post, thanks for continuing to write great information.